So much yarn, so little time. : My flutterbutt has arrived! First of all - oops! If anyone was reading earlier today, I'd changed some settings and was suddenly writing in Hindi...no mean achievement, I feel! A short while ago I was chatting on the Etsy Forums when the lovely Raisinlike asked me about trading. I was absolutely thrilled, I've loved her shop for ages. Convos flew backwards and forwards as we tried to decide how many items we could bear to limit ourselves to. I asked for a flutterbutt for my husband, for Valentine's Day - but it was impossible not to rip open the envelope and share straight away. 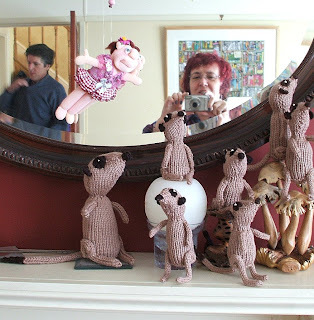 As you can see, she's already found a home watching over my meerkats! I also asked for an Etsy Sales Fairy so I probably won't have time to blog any more - I'll be too busy wrapping parcels and going to the post office. Last but not least, the perfect Valentine's Day card. Ooh she looks so cute over there, and it is clear she enjoys herself! I am very happy you like her. Here's for happy tradings! So cute! Love the meerkats watching her fly!